Wandsworth Council planning committee agreed unanimously at its meeting 25 June to reject the planning application. “We had no problem with a hotel in this location – it would clearly be a benefit to the town centre. The concerns were more about whether the site could accommodate a building of this size. The new structure would be out of scale with the nearby houses in Mossbury Road. There is scope for a taller building here but it must respect its immediate surroundings and the properties around it. The committee concluded that the scheme would result in an overbearing and dominant development which would fail to preserve or enhance the Clapham Junction conservation area. In rejecting the application the planning committee took account of the recommendation of the planning officer to reject the application because of the ‘unduly prominent‘ height of the design and that it would ‘fail to preserve or enhance the character of the Clapham Junction conservation area‘. In addition the proposed hotel was not accessible to people with disabilities and did not meet sustainability and environmental criteria. At the meeting Councillor Martin Johnson outlined concerns about the unsuitability of the proposal. He spoke extensively about the downside of the proposal and put forward many arguments we would agree with about the unsuitability of tall buildings in this area. Councillor Tony Belton said that the council should reconsider its emerging policy towards buildings in view of the clear public view that they were not wanted. Some members of the committee were keen to see regeneration in the area, but doubts were expressed about whether such a scheme would really help to regenerate the area as claimed. Councillor Belton pointed out that people often use hotels literally just for bed and breakfast and then spend the rest of the day in London on either tourism or business, and that the developers were only claiming to be creating 30 jobs and these were relatively low paid. Some councillors spoke about benefits of having a hotel in terms of regeneration for the area, but no one spoke up for the design or defended the height of the building. It seems that the recommendation of the planning officer and the comments of many is that the building would tower over surrounding buildings and would be inappropriate for the conservation area clearly swayed the committee. Even if they didn’t state that this was the reason for the rejection, the decision is another nail in the coffin for unwanted tall buildings in the area, and a recognition of the public view that such proposals would be unsuitable and unwanted. On the request of the applicant the decision has now been referred to the Mayor of London who will decide whether to intervene. The applicant argues that by rejecting the scheme the council risks deterring further investment in the town centre contrary to the Mayor’s regeneration policies. But the Mayor’s office had objected to the application in relation to sustainable construction techniques and the lack of disabled access facilities, amongst other things (you can read the Mayor’s office opinion here). Although the chair of the planning committee was careful not to rule out tall buildings on principle, it is clear that this building was rejected for that reason. Perhaps the council will now listen to people who live and work in the area who don’t want to see its character changed or to see a succession of threats to change its character by yet more unsuitable proposals. I cannot make the Planning Committee meeting tonight but some others will report for us on the website. “Wandsworth councillors are expected to reject plans for a 16-storey hotel in Clapham Junction on Thursday night, just 48 hours after heritage group English Heritage (EH) said the area was “at risk of losing its character”. On Tuesday English Heritage said 81 of 486 conservation areas surveyed in London – including Clapham Junction – were threatened by “neglect, decay or damaging change”. The statement from English Heritage they refer to is here (BBC website). We have reported about the planning officer recommendation there. Clapham Junction Hotel: Town planner recommends refusal. The planning officer has recommended that the Planning Applications Committee reject the application for a 16 storey hotel in 155 Falcon Road (site of the old Job Centre, bottom of Mossbury Road). The report follows essentially two objections: the one submitted by English Heritage (commented here) and the one submitted by the Mayor of London’s office (commented here). On the height issue, the comment highlight that “for most objectors, the height of the building is the most significant and contentious aspect of the proposal“. As we have previously written, the decision to proceed with the hotel scheme was specifically driven by the Council’s recommendation in its Core Strategy document that Clapham Junction was a suitable location for regeneration through the construction of tall buildings (part. 4.132 of the document). However the town planner follows here the argument of so many objections, in line with English Heritage and CABE, and says: “there are serious doubts as to whether the application site can adequately accommodate a building of this size in townscape terms. […] The proposed building significantly exceeds the prevailing height of surrounding buildings, while there are no other examples of tall buildings within the Clapham Junction Town Centre“. We also note that the planning officer considers the size of this very compact site and writes: “The new building would result in an overdevelopment of the site reflected in the exceptional high plot ratio and it would be an unduly bulky and prominent building in relation to the extent of site. […] The proposed building does not physically integrate with its surroundings and would dwarf the surrounding buildings; in particular it would be out of scale with the houses in Mossbury Road. In this context, the site would not be suitable for a sixteen-storey building“. More surprising (but very welcomed) when you keep in mind the very positive view given by the planning service to the erection of two 42-storey towers in a previous application in Clapham Junction, less than 50 yards away from the proposed site of the hotel, the town planner says: “the building does not relate to its environment, and it would be highly prominent in views from most directions. Although the proposal would replace a building of no particular merit, and a taller building than the existing height might be achievable, it is difficult to argue that this proposal meets the policy tests and would not make a positive contribution to the townscape and the public realm“. English Heritage’s comment was also deeply used in criticising the design and the report says that “the development does not respect the grain of the conservation area, and due to its sheer size and design it would fail to preserve or enhance the character and appearance of the conservation area. […] The proposed building would impinge on the local views towards the two listed buildings of the former Arding and Hobbs building and the Falcon public house“. The report quotes the criticisms of the Mayor of London’s letter in reference to sustainable construction techniques, comments that the proposals does not comply with the climate policies of the London Plan and the issue on lack of enough disable access facilities. In addition the planning officer says that “notwithstanding the above analysis, it is considered the proposal would result in an unneighbourly overbearing and dominant development when viewed from properties in Mossbury Road, and would create an undue sense of enclosure“. After the number of objections made by the Mayor of London’s letter (along with suggestions to possible remedies) the developers were expecting to go before the Planning Committee at a later date (July or later) in order to have further time to submit more documents supporting their case. However, the planning officer considers that “there is an “in-principle” objection to the height of the proposed development and that this would not be overcome by additional graphics“. We can only welcome this recommendation and hope that this will prefigure further changes in the Core Strategy regarding the possibility of tall buildings in applications submitted for Clapham Junction. The decision to proceed with the hotel scheme was specifically driven by the Council’s recommendation in its Core Strategy document that Clapham Junction was a suitable location for regeneration through the construction of tall buildings (part. 4.132 of the document). Up to June the 19th, we counted 85 objections on the Council’s website. There is only 12 letters supporting the application. Most of the objections are concentrating on the size of the building (excessive development of the site, not in scale with the nearby Victorian and Edwardian low rise houses, out of character and inappropriate impact on conservation area, makes a mockery of the whole principle of conservation area, etc) and some highlight that the recent campaign against the station redevelopment has clearly shown that residents do not want tall towers. Additional objections show concerns on noise, deliveries, congestion (parking space) and impact on neighbours (all what you can also already read here and there for example on our website). 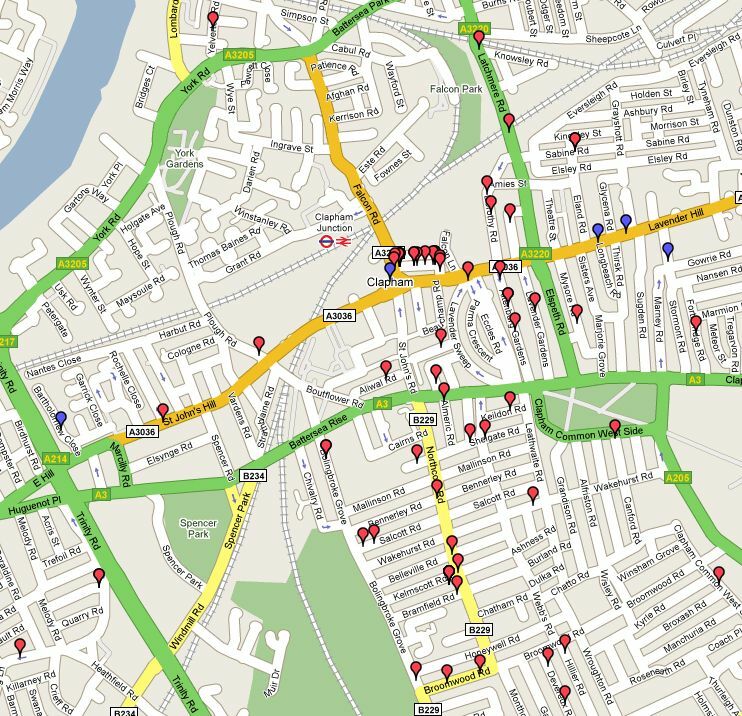 As presented by this map, the “extensive” consultation conducted by the developers in the adjacent street of Mossbury Road was clearly not sufficiant and a clear concern is shown by residents in the all vicinity of Clapham Junction town centre. The Battersea Society acknowledges that hotel accommodation is a desirable use in Battersea Town Centre, and potentially on this site, but wishes to object to the scale and height of this proposed building. We consider a 16-storey building would be entirely out of place on a site which is so significant in relation to the Clapham Junction Conservation Area and the listed buildings it contains. It does not appear that the plans have been developed in consultation with an operator for a hotel once built. We suggest that an operating plan ought to have been developed as a basis for decisions regarding number and size of rooms required for economic viability and the grade of hotel accommodation appropriate for this site. The height of the proposed tower is the result of using only part of the site for the bedroom block, and alternative approaches coudl have been adopted. We urge the council to reject the present proposal. We believe that the height and general massing is excessive in this location, although we accept that the proposed use would be suitable, being close to the transport interchange and shopping facilities. The height of sixteen floors would be completely out of character with the conservation area and would dominate the adjoining low-rise Victorian houses in Mossbury Road whose residents would suffer from a substantially increased noise level with deliveries at all time of the day and night. Service traffic will be considerable for a hotel of 132 rooms, including a conference centre and could cause serious problems for this already very busy road junction. There will also be greatly increased pressure on residents’ parking space, as no on-site parking, or dropping-off spaces for guests is provided and outside business hours parking will be difficultor impossible to control. There are no off-street public parking areas in the immediate vicinity. we understand the nearby supermarkets are adamant that their car parks are for shoppers only. In the absence of a comprehensive plan for the area, we believe that the proposal will set a precedence for buildings of similar height and mass that is unacceptable. We trust that you will take these objections into account in your consideration and report to the Committee and recommend refusal for the application. We have published a leaflet that we distributed mainly to residents of Mossbury Road 2 weeks ago (mainly to people I – and my neighbour – were able to speak to actually – no time to do more rounds unfortunately 😦 ). For information, you can view it here. … more update to follow soon today! [From Cyril Richert: We publish below the comment sent by the Mayor of London’s office regarding the planning application for a Hotel in Clapham Junction (full letter here). I highlighted in bold some parts. I refer to the copy of the above planning application, which was received from you on 6 April 2009. On 10 June 2009, the Deputy Mayor Policy and Planning, acting under delegated authority, considered a report on this proposal, reference PDU/2Ö02/0l. A copy of the report is attached, in full. This letter comprises the statement that the Mayor is required to provide under Article 4(2) of the Order. The Deputy Mayor considers that the application does not comply with the London Plan, for the reasons set out in paragraph 48  of the above-mentioned report; but that the possible remedies set out in paragraph 50  of this report could address these deficiencies. If your Council subsequently resolves to make a draft decision on the application, it must consult the Mayor again under Article 5 of the Order and allow him fourteen days to decide whether to allow the draft decision to proceed unchanged, or direct the Council under Article 6 to refuse the application, or issue a direction under Article 7 that he is to act as the local planning authority for the purpose of determining the application and any connected application. You should therefore send me a copy of any representations made in respect of the application, and a copy of any officer’s report, together with a statement of the decision your authority proposes to make, and (if it proposed to grant permission) a statement of any conditions the authority proposes to impose and a draft of any planning obligation it proposes to enter into and details of any proposed planning contribution. Urban design: The proposal for a tall building on this highly accessible town centre site, which could create a landmark building and act as a catalyst for urban regeneration, is compliant with London Plan policies 4B.1, 4B.2, 4B.8, 4B.9, 4B.1 0 and 4B.13. However, the hotel entrance ground floor elevation requires further design alterations. Inclusive design: The application fails to include any wheelchair accessible bedrooms contrary to London Plan policies 30.6 and 4B.S. Climate change mitigation and adaptation: The climate change mitigation proposals do not comply with the climate policies of the London Plan, particularly 4AJ, 4A.4, 4A.S, 4A.6 and 4A.7 for reasons set out paragraphs 25-31 above. No information has been provided on climate change adaptation contrary to policies 4A.10 – 4A.16 and the Mayor’s Supplementary Planning Guidance (SPG) ‘Sustainable Design and Construction’. Urban design: Further cross sections and elevations should be provided of the hotel entrance ground floor elevation to demonstrate how hotel patrons/employees, refuse servicing, and cyclists would comfortably enter and exit the building, taking into account the gradient 0n Mossbury Road. The design of the ground floor elevation should be revisited to relate better to the first and second floor elevations above. Inclusive design: The application should include at least seven (5%) fully wheelchair accessible bedrooms which should be clearly shown on the floor plans and referenced to in the access statement. A typical floor plan layout of an accessible room should also be provided. Climate change mitigation and adaptation: The applicant is requested to submit an amended energy statement with reference to the detailed information required, and a sustainability statement should also be submitted referencing the Mayor’s essential and preferred standards as set out in the ‘Sustainable Design and Construction’ sPG. paragraph 21: “It is not clear whether the ground floor elevation will achieve a practical and legible street level entrance to the hotel. The elevation appears unwelcoming and unresolved. Further cross sections and elevations should be provided for this part of the building to demonstrate how hotel patrons/employees, refuse servicing, and cyclists would comfortably enter and exit the building, taking into account the gradient on MossburyRoad“.